The founding father of Indonesia, Ir. Soekarno, said “Nationalism cannot flower if it does not grow in the garden on internationalism”. What is Nationalism? And What is Internationalism? Soekarno stated that the first principal which must underlie the philosophical basis of a free Indonesia is Nationalism. Then he emphasized undoubtedly there was a danger in this principle of nationalism, it was that men will reduce nationalism to chauvinism. Furthermore, the second principle was proposed as internationalism. These two principle are dovetailed together, so that Nationalism and Internationalism are two things which can not be separated. It is impossible that there will be internationalism if there is no nationalism, and also nationalism needs internationalism as the place to exist. Nationalism is a primary reason why a state can be independence. Without it, how come a state is being a state? Nationalism is ism or belief that tried to protect the sovereignty of a state. State cannot survive without nationalism belief in their people, mostly nationalism is appear because of common goal in people. Indonesia, for example, that being colonialize by Dutch then Soekarno and his allies struggle to get independence. That independence must have common goal, like to increase welfare of people in Indonesia. Issue of nationalism has many form, like Indonesia has many cultures but those cultures is in danger state when globalization arise and make people more interested in western cultures, as Indonesian we must defend our culture from another country influence. If we talk about internationalism, in this globalization era internationalism is commonly for the people worldwide. It make people even state to behave well in international environment owing to the fact that we are already being part of international society. We can also say that internationalism is unlimited, because the basis of internationalism is very abstract, it can be based on major influence such as western country. While nationalism has its own limit because nation has boundaries like law, etc. Muslims represent an estimated 23% of the global population or about 1.8 billion consumers with an average growth rate of 3% per annum. If this growth trend continues, Muslims are expected to make up about 26% of the world’s total projected population of 2.2 billion in 2030. Indonesia has the largest muslim population in the world, with more that 88% citizens are muslim. The global halal industry is one of the fastest growing consumer segments in the world. The global halal market is no longer confined to food, it has now expanded beyond the food sector, include beauty cosmetics and fashion. Halal, which means lawful or allowable, is non-exclusive to Muslims, and has gained increasing acceptance among non-Muslim consumers. The appendage of “Halal” to a product becomes a global symbol for quality assurance and lifestyle choice. Many Western countries have recognized the emerging global trend in consumerism towards halal products and services, and are now racing to gain a footing in the halal industry which provides high quality, safe and ethical products. 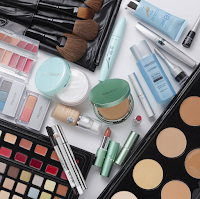 In the scope of halal cosmetics, the concept covers critical aspects of production such as halal ingredients and usage of permissible substances which must be manufactured, stored, packaged and delivered in conformity with shar’i requirements. Interestingly, halal cosmetics has also gained momentum amongst modern consumers who are eco-ethical conscious and are willing to pay a premium for organic, natural and earthy cosmetics products to suit their modern lifestyle. Besides that, the halal label on cosmetics and beauty products appeal to consumers seeking integrity and authenticity in their cosmetics and personal care products. 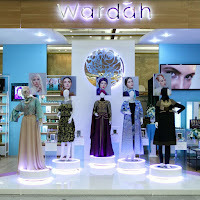 Although the concept of halal cosmetics is new to the Muslim world, there is a growing demand especially from conscientious consumers who are becoming more selective in their choice of personal care items, and consciously choosing to spend money on cosmetics and beauty products that fit in with their religious and cultural requirements. As we know, many cosmetic products contain alcohol which is deemed as haram, and animal sourced components considered impure by Islam. Growth in the halal cosmetics market is mirrored by a growth in consumer knowledge about the ingredients used and product awareness, fuelled by social networks. At present the halal cosmetic market contributes 11% of the total global halal industry. The market for halal cosmetics is booming in the Middle East and Asia. 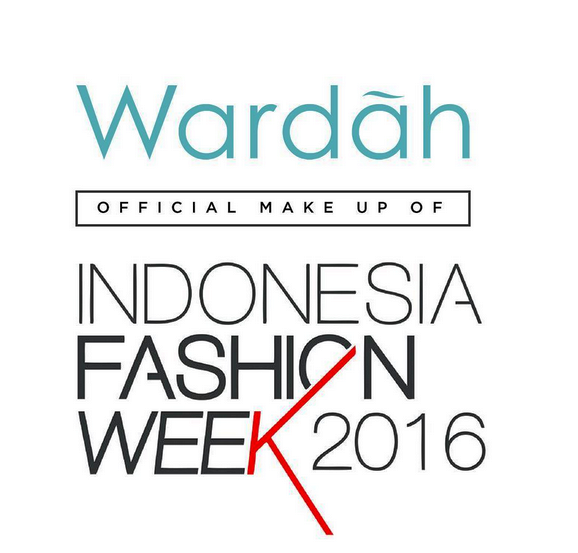 Wardah is a pioneer of halal cosmetics in Indonesia. 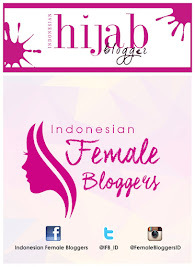 It is established by Nurhayati Subakat, Apt., who is also the CEO of PT. Paragon Technology and Innovation (PT. PTI). It has been doveloped for more than 20 years, and now is being the biggest halal cosmetics products in this country. The products have high quality as well as other international cosmetics. 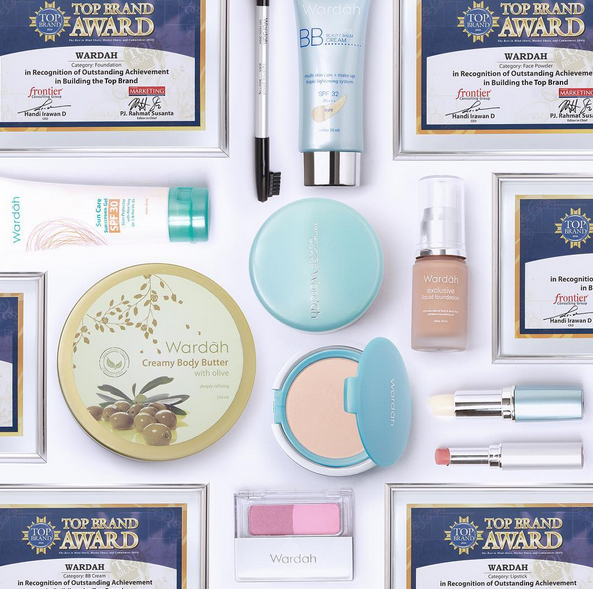 Many Indonesian inspiring women use Wardah as their primary beauty items. 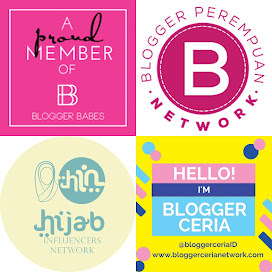 They are also hired as the Brand Ambassador, three of them are Dian Pelangi, Inneke Koesherawati, and Dewi Sandra. 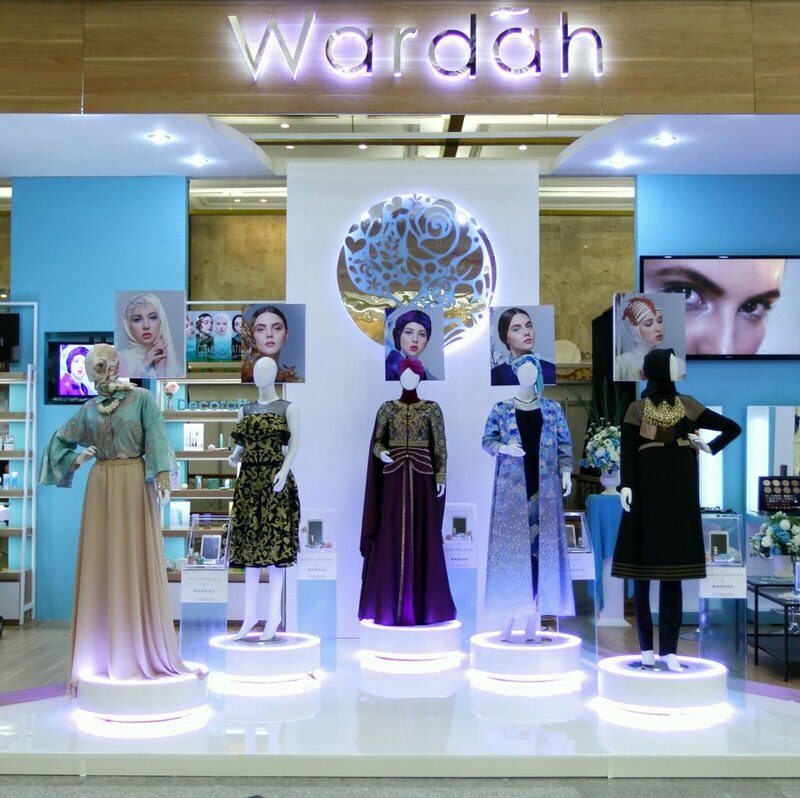 With the tagline of #HalalDariAwal, in 2016 Wardah determine to reach a wider market not only for domestics but also they are ready to go public internationally. 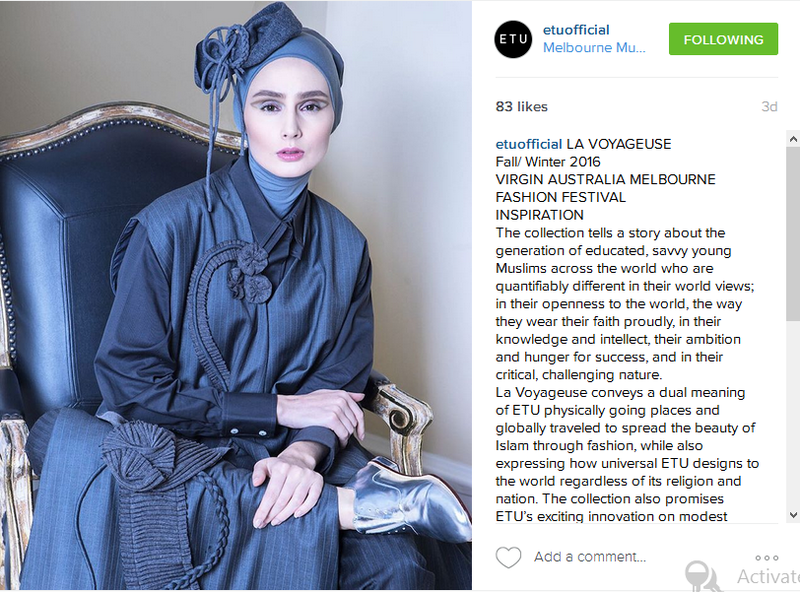 One of the evidence is Wardah becoming the main sponsor of ETU in Virgin Australia Melbourne Fashion Festival (VAMFF) 2016. Another aspects of Halal products is Attire, which is related with fashion. This is also called as Modest Fashion. Based on Oxford Dictionaries, Modest means (Of a woman) dressing or behaving so as to avoid impropriety or indecency, especially to avoid attracting sexual attention; (Of clothing) not revealing or emphasizing a person’s figure. The fastest growing region for halal products is Asia, driven by countries like Indonesia, Malaysia, Pakistan, China and India. Since this region has the largest Muslim population in the world, Asia has become an important and lucrative halal market. The competition is getting tougher. Malaysia, for example, has been aggressively promoting itself as a leader in the global halal industry, while Indonesia also declare will be the center of modest fashion in the world in 2020. To make this comes true, some preparations have been done by some parties, such as government, designer, etc. The most important strategy is branding. A right branding will contribute to affirm the character of business and modest fashion in this country. 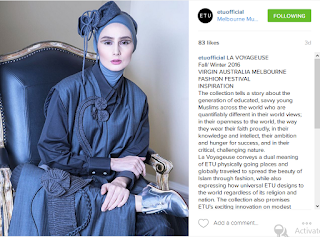 One of Indonesian Designer who supporting and creating fashion in halal attire is Restu Anggraini. She graduated from Phalie Art Studio and ESMOD Jakarta on 2011, and she is well-known for her contemporary, modern, and elegant modest wear designs. She decided to launch RA by Restu Anggraini brand in 2011 for smart casual modest wear outfit, and ETU for the premium collection. She joined Indonesia Fashion Forward program that introduced her with professional fashion industry, where every single thing is considered, not just clothing, but the branding and every other subtle details. 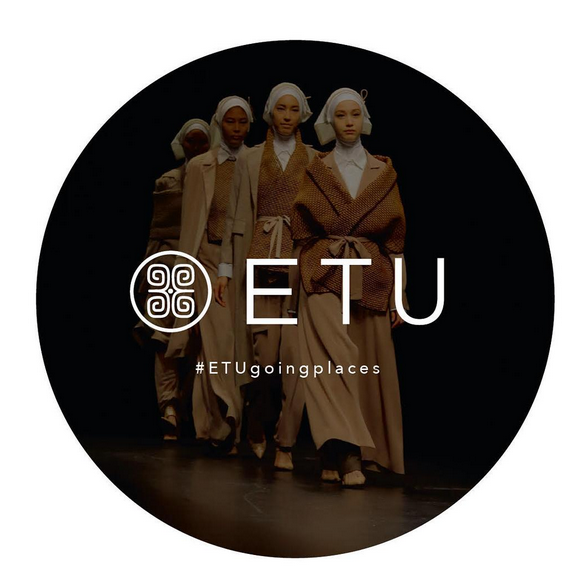 ETU is created to serve the growing needs of women across the world seeking for honest Modest Workwear, allowing women to express their desires and personalities through simple yet cutting-edge design. 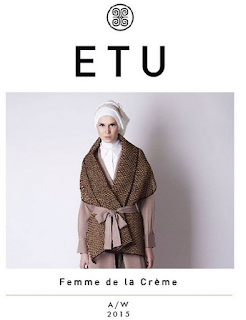 ETU’s signature is simply chic, modest, clean cut, and unique details. Along with the development of Modest Fashion, ETU increasingly spread its steps to International. Restu also has been introduced her products in several countries through exhibitions of fashion, like the Mercedes - Benz Fashion Week Tokyo 2015, Jakarta Fashion Week, Indonesian Fashion Week, and London Fashion Showcase at London Fashion Week 2016. 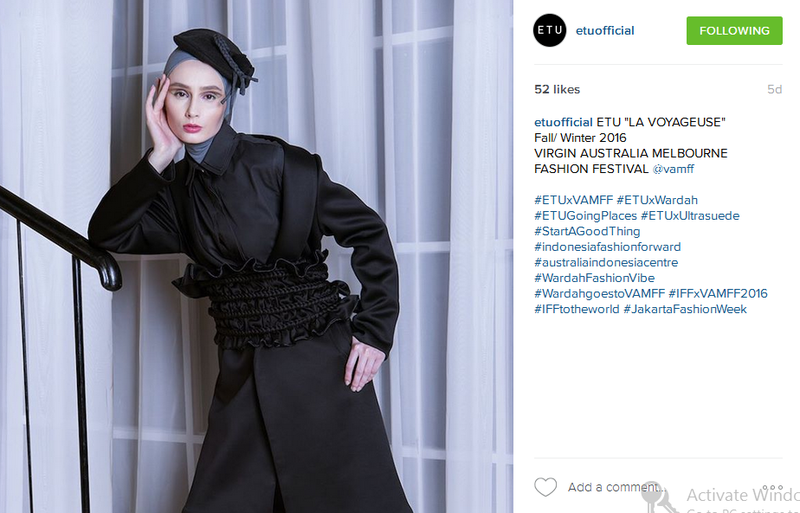 The special one, as the winner of The ANZ Australia Indonesia Young Fashion Designer Award, ETU represented Indonesia in Virgin Australia Melbourne Fashion Festival 2016. 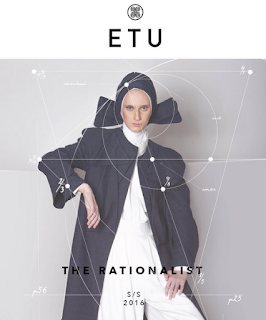 ETU is the first modest wear brand that would present a runway show at VAMFF. The Virgin Australia Melbourne Fashion Festival (VAMMF) is an annual celebration of fashion, beauty, business and creative endeavour for everyone to enjoy. Established in 1997, the event stimulates and celebrates the Australian fashion industry whilst providing employment, networking and professional development opportunities for fashion, beauty, design, creative, marketing and retail industry professionals. The Festival also offers premium tailored corporate entertainment packages and exclusive sponsorship opportunities that include unique experiential marketing and brand touch platforms. According to the sensus Islam is the third largest religion in Australia, 2.2% of Australians are muslim (2011). 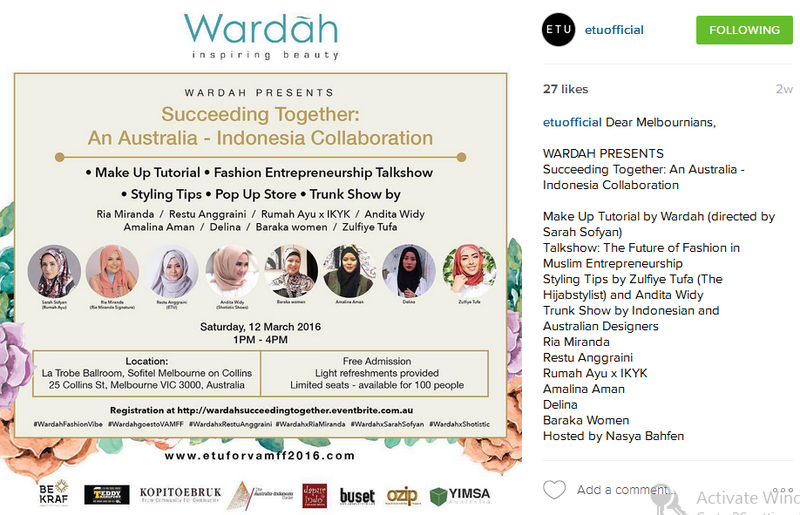 This will become a potential market especially for Indonesian modest fashion designers to brand their products there. 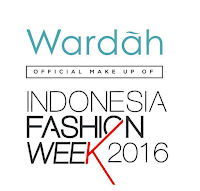 We can present to International that Indonesian people, Indonesian designers have high quality of creativity in fashion. Indonesian products are able to be competitive with other countries in global market. In business, there is demand and supply. The higher the demand, the price will be higher too. Price is moving in line with supply and demand. Business will always see the potential financial and quantity. 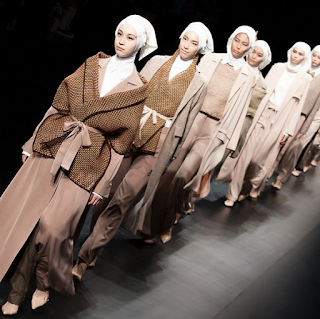 The potential of modest fashion market could drive the country's economy with all its multiplier effect. 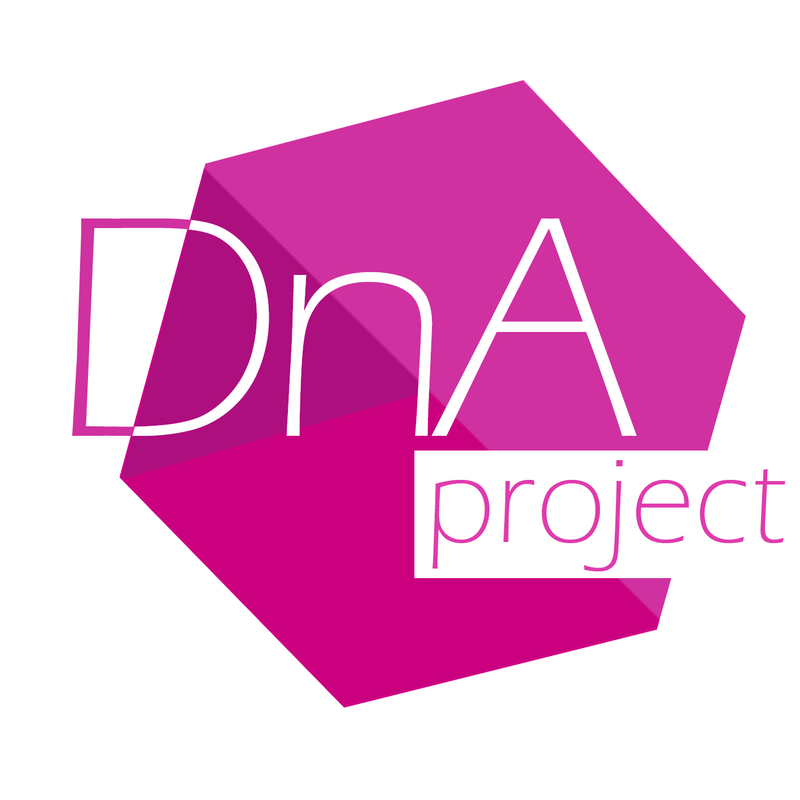 Effort in the fashion industry , educating them to increase the capabilities of industry players, as well as educate the market should from the beginning a joint commitment of all stakeholders. This will be a huge potential business which should continue to be grown, communicated from Indonesia to the world. 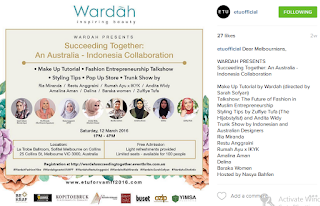 As the main sponsor of ETU, Wardah presents post event engagement as a perfect platform for both countries to exchange diversity and to create new friendships and business opportunities in fashion. Both ETU and Wardah are local brand which grow as the pioneer in inspiring other Indonesian brands to be more competitive not only in Domestic market but also in International. They inspire a lot of people in order to have a high work spirit. 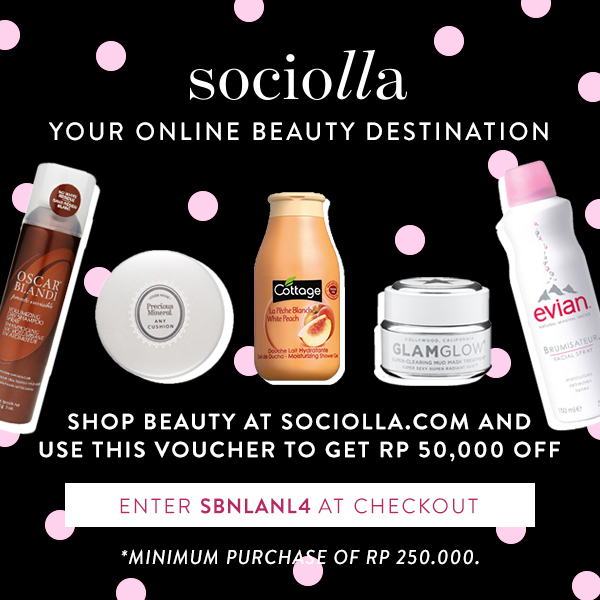 They also indirectly enhance the positive competition among each local brand itself, and of course between local and international brand. Furthermore we can show and prove to the world that “Indonesia Pasti Bisa!!!" Nationalism and Revolution in Indonesia by George McTurnan Kahin. 2003. Southeast Asia Program Publications, Cornell University, Ithaca, New York. The Global Halal Industry; An Overview.